Now I'm sure like you, when I first heard the title Mumfie’s Quest: The Movie, I was a bit confused as I actually hadn't heard of this cartoon before. The cover intrigued me though as the elephant (or Mumfie) looked like a toy I used to have when I was little called a puffalump or something of that nature. I figured this would be quite the cute special to watch with the kiddos! 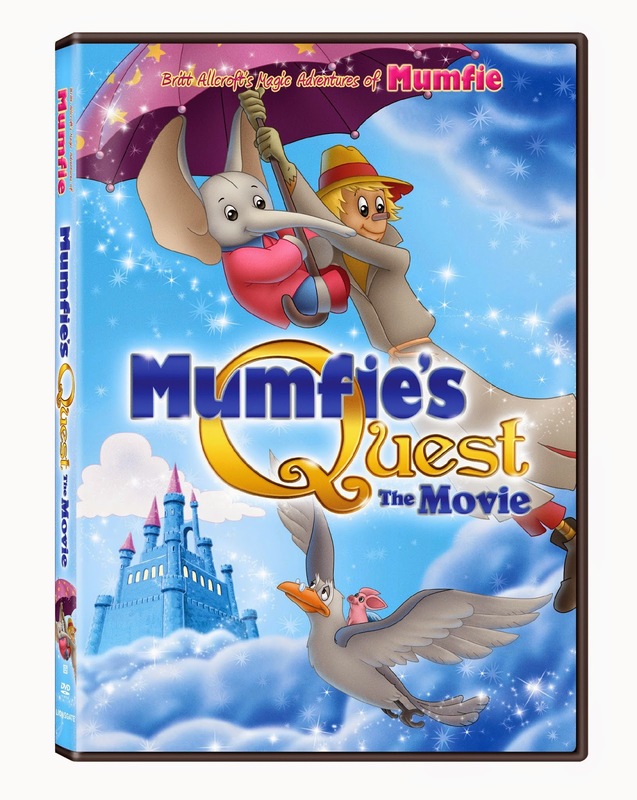 Arriving on DVD, Digital HD, and Video on Demand on July 22nd, 2014, our family was able to preview the magical special, Mumfie’s Quest: The Movie! The synopsis says "Mumfie, a little elephant with a big heart, ventures far from home in search of friendship and adventure. Along the way he meets new friends, Scarecrow and Pinkey. When Pinkey tells Mumfie about her longing to find her mother, they begin a search to find Pinkey’s mother on a gloomy, misty island. Soon they find themselves on an even bigger quest to help restore laughter and fun to the islands. The whole family will enjoy this imaginative and delightful tale with its lovable characters." I have to say I thought the stories were adorable and the themes were perfect for the boys. Declan was actually my buddy watching this one! He cuddled with me and actually talked to the characters throughout the program. Recommendation: Declan really liked this one and it was something I actually enjoyed a bit. Declan really liked the characters and it was one of the only times I've had Declan cuddled up with me for an hour straight watching the TV. Again I just wish it was a little bit longer. Giveaway: Lionsgate is going to give one of A Lucky Ladybug's lucky readers Mumfie’s Quest: The Movie on DVD to have of their own! My granddaughter's favorite toy is her American Girl doll. My grandson has this little white lamb that he just loves! Goes to sleep with him all the time too. My granddaughter would like it. Her favorite toy is her Disney princess dress. Her favorite toy was a stuffed Alf. My childs favorite toy is a Thomas the Train shaped whistle. I'd like this for my niece. She has a doll that goes everywhere with her!! I would love to win this for my niece! My grandson's favorite toy is his big truck. Our baby granddaughter's favorite toy is her miniature piano. My grandson loves Thomas the Train and his stuffed dinosaur.